NHL.com - Montreal Canadiens goaltending prospect Zachary Fucale is finally ready to embark on his professional career after four seasons and 204 games played in the Quebec Major Junior Hockey League. "Yeah, it was a couple of games, but it was the best time," Fucale said this week at the NHL Players' Association Rookie Showcase in Toronto. "I got an opportunity in Halifax when I was 16 and I'm happy the coaches had the confidence to send me in there night after night. I learned a lot with some pretty awesome players, some great teams, and I had some pretty good opportunities. So I'm grateful for that." The kind of opportunity given to Fucale to jump right in and play 58 games for the Halifax Mooseheads as a rookie is not likely to come from the Canadiens any time soon. Montreal goaltender Carey Price is coming off a historic season in which he won the Vezina Trophy, Hart Trophy, Ted Lindsay Award and William Jennings Trophy. At age 28 and with three seasons remaining on his contract, Price is not likely to leave the Canadiens crease in the near future. But that fact is not going to change Fucale's focus as he prepares for his third training camp with the Canadiens, his first when going back to junior is not an option. "My goal, my dream, my vision is to play in the NHL," Fucale said. "That's where I want to play. Every time I get to be in an NHL camp, that's a chance to be up there. So my goal is to play in the NHL, whether I'm 18 or 30. That's what I want to accomplish, I want to prove to the Montreal Canadiens that I can play. "I'll just take one step at a time. This year I'll do my best to stay up there, but if it's in my best interests to play in the minor leagues for a bit that's exactly what I'll do and I'll prove myself there and accomplish my dream from there." Fucale is a native of Rosemere, Quebec, a Montreal suburb about 20 miles north of Bell Centre. So being taken with the No. 36 pick of the 2013 NHL Draft by the Canadiens was obviously a big deal for the people close to Fucale, as evidenced by his father Jack's enthusiastic reaction upon hearing his son's name called at Prudential Center in Newark, New Jersey. Since he's been to two training camps already, Fucale says the one thing people ask him all the time is if he's become friends with Price, the person whose job he hopes to take one day. "When I'm at camp he's getting ready for a season, he's not there to socialize," Fucale said. "He's there for business. He's there to prepare himself for the season. So no, I didn't get to have the biggest conversations with him. And no, we didn't become the best of friends, like most people ask. "But I did get the chance to be on the ice with him and learn from just watching and looking not only at Carey Price, but every pro player that's there. You get to know what it's like and learn from their habits, what they're doing, how they get prepared. For me as a goalie, I'm very lucky to have Carey Price, to have one of the best goalies in the world there to learn from." Fucale's relationship with Price may begin to grow from here as he becomes a fellow professional, even though Price would appear to be his biggest roadblock to an eventual starting job in the NHL. But if there is one person who would know how quickly circumstances can change, it would be Price. When he was taken by the Canadiens with the No. 5 pick in the 2005 draft, Montreal was seemingly set in goal with Jose Theodore. Theodore won the Vezina and Hart trophies in 2002, and the idea that he would need to be replaced so soon after that seemed ridiculous at the time Price was drafted. But Theodore's level of play fell off a cliff in 2005-06 and the Canadiens traded him to the Colorado Avalanche on March 8, 2006. A year and a half later, Price was starting the 2007-08 season in Montreal. If Fucale ever feels as though his time in the NHL will never come, he only needs to look at the man standing in his way to know that's not necessarily the case. 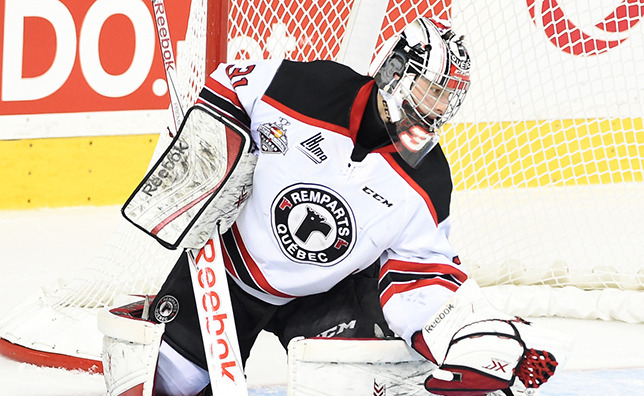 "It just proves that so many things can happen in a couple of years," Fucale said. "The League is changing fast, there's players moving all the time. For me, all I have to do is get ready, get better and get to the NHL level. That's where I want to be, so I want to move up levels in my game as quickly as I can, but also not skipping steps."